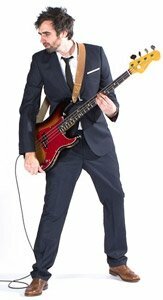 I am an established bass guitar teacher available in Chessington, South West London and Surrey. I can teach from my music studio in Chessington. I live only 2 minutes walk from Chessington train station and have spare amps and instruments for you to use. I am a performing and recording bassist, teacher, composer and producer. I am currently the Bass Guitar tutor at Wellington College in Crowthorne, but privately I teach people of all ages and standards, from 6 to 60. Performance wise, I've performed all over the world with a whole host of different musicians and performers. Pop, rock, soul, funk, hip-hop, jazz, drum and bass, etc, etc. I have performed at most of the major UK festivals and venues, but at the moment, I play bass for 80's icons T'Pau. I also play in a few successful cover bands aswell as original acts, so I teach a whole load of tunes that you'll know as well as important excersies and techniques. I am currently the Bass Guitar tutor **Removed By Admin** in Crowthorne, but privately I teach people of all ages and standards, from 6 to 60. I was also the bass tutor for Bournemouth University from 2004-2006 until I moved back to London. My teaching technique varies from pupil to pupil, no one learns in the same way, so we'll tailor a regime that suits you. But because I have played in so many bands, I have a huge repertoire of tunes that I know and can teach. Of course we'll do some scales and exercises, but mainly, we'll be looking at popular tunes and bass lines as a way to teach technique and theory. This will also give you an arsenal of popular tunes that you know when you start playing in bands, having fun and maybe making some money!! We'll look at tunes you know, tunes you want to know as well as some tunes you won't of heard of. This makes the lessons fun and will give you a lot to do in between lessons.